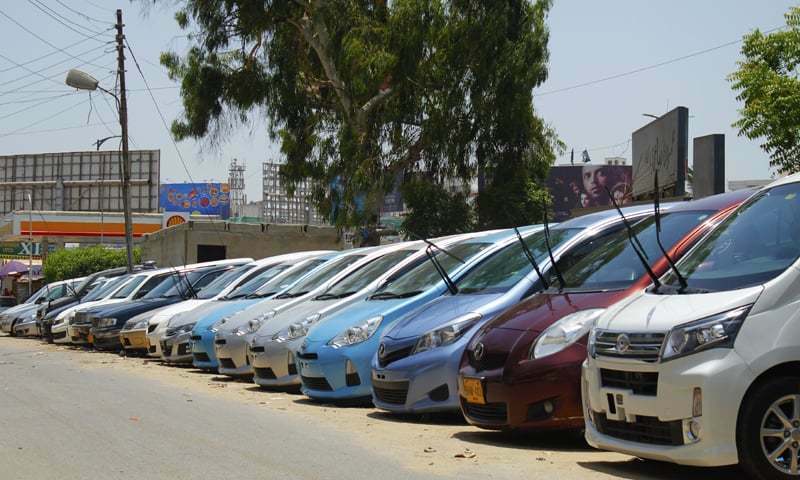 KARACHI: The Ministry of Commerce (MoC) has revived a condition for used car imports that proved controversial last time it was introduced. The condition is that payment of duties and taxes for all car imports be made in foreign exchange to be directly remitted from abroad by the person importing the vehicle. Most used cars are imported in Pakistan under baggage rules or gift scheme, which is designed for personal purposes only, but are then sold off in the market. Car assemblers and their vendors are relaxed on the move, but traders of used cars anticipate drastic fall in import. As per MoC’s order on Jan 15, 2019, duty and taxes on all imported vehicles, in new and used condition, under personal baggage or gift scheme will be paid out of foreign exchange arranged by Pakistani nationals themselves or local recipients supported by bank encashment certificate showing conversion of foreign remittance to local currency. “It is a right move by the government,” Pakistan Automotive Manufacturers Association Director General Abdul Waheed Khan tells Dawn. The government, he said, has revived the condition of payment of duties and taxes in foreign exchange now after the previous government took the move and abandoned it within months, back in February 2018. The condition was imposed in November 2017 as a measure under Auto Policy 2016-2021 requiring users of baggage scheme to pay their duty and tax in foreign exchange. The idea was to restrict misuse of the facility by traders, since the practice created a drain on local foreign exchange reserves by sending the cost of vehicle from Pakistan in foreign exchange through other hundi and hawala channels. As per MoC’s order, the remittance for payment of duties and taxes must now originate from the account of the Pakistani national sending the vehicle from abroad. The remittance shall either be received in the account of Pakistani national sending the vehicle from abroad or, in case his account is nonexistent or inoperative, from the account of a family member. Data of the Pakistan Bureau of Statistics shows that imports of completely built-up cars (90 per cent used cars) fell by 43pc in the first half of fiscal year 2019. The total imports were $156 million versus $277m in same period last fiscal. He said this decision would encourage assemblers and vendors to make future expansion and investment without any fear of competition from used car imports in future. All Pakistan Motor Dealers Association Chairman H.M. Shahzad recalled that dealers suffered heavy demurrages when the same decision was taken in 2017 due to which importers could not clear vehicles from the port from October, 2017 to March, 2018. He said the government had taken a one-sided decision without taking used car importers into confidence. “Used cars imports will see sharp plunge in coming months as the government has made future imports impossible,” he said. Almost one million vehicles are sold in the market annually in which local assemblers supply about 250,000 vehicles and about 70,000 are imported. The rest of the public is dependent on buying five to 20-year-old used cars. Besides, 95pc of the used imported cars are of 660-1,000cc which have very good mileage on petrol. The 660cc vehicles are not assembled in Pakistan. Transfer of residence, personal baggage or gift scheme are the only mechanisms through which import of new/used vehicles are permissible in Pakistan. In absence of any other means for import of vehicles, by virtue of this SRO, import of vehicles, which generates handsome revenue for the government in shape of import duties, levies and income tax, is likely to be shut down completely, bringing revenues to zero, he said. In absence of imported vehicles in the market, the public will be at the mercy of local assemblers who, after new decision, will sell their products at exorbitant prices owing to the lack of competition. Due to limited production capacity of local assemblers, the on-money or premium over the actual price of a vehicle would also increase manifold. If the government thinks that the present schemes are being misused, then it should allow commercial imports so that the used car import business may continue, he said. Mr Shahzad said that importers will urge Prime Minister Imran Khan and Finance Minister Asad Umar to review the decision and hold a meeting with used car dealers on the issue.